The links for the Marketing Graphics Toolkit have been updated to reflect the latest v4 release, which now includes even more premium modules. Who wouldn’t want their sales to skyrocket? But what are you actively doing to ignite your sales? Like many beginning Internet Marketers, you are likely operating on a shoestring budget and cannot afford to create slick sales pages full of fancy graphics like you see so many of “gurus” use. Chances are you’re not an expert graphic designer either, I know I’m not! Limited funds…lacking graphical talents…is there any chance to be successful? I recently had the opportunity to purchase a marketing graphics toolkit that provides all of the tools that you need to easily build a killer looking sales page or promotional items for your product. 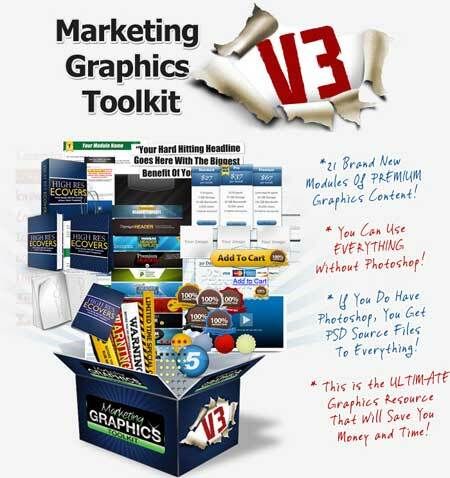 With this marketing graphics toolkit, you get 21 ready to use modules of premium graphics content. And not only does the toolkit come with layered PSD files for those with Photoshop, you also get Sumo Paint (an outstanding free graphics application) templates along with web ready image formats. For a more thorough listing of everything you get, I’ve provided a snapshot image of the package below but I highly recommend visiting the main page to really appreciate the value. Using this marketing graphics toolkit you can easily put together a great looking site, even without knowing how to use Photoshop. As an example, I put together Remarkable PLR in no time at all by utilizing just a few of the modules available in the toolkit. Sounds great, but what’s the price? Without getting into too much of a “salesy” mantra, and quite honestly I don’t need to because the value in this toolkit is easily recognizable by anyone that has put together a website, you can grab this marketing graphics toolkit for less than $20 bucks! The toolkit easily saved me hours of futzing around with Photoshop to put together that Remarkable PLR website, and that is no doubt worth much more than the few dollars it cost me. So, if you’ve ever found yourself wanting to put together an outstanding website but had your hands tied due to budget or your abilities, I highly recommend you give this toolkit a try. You’ll quickly have a professional looking site that will most likely lead to a nice surge in your sales or conversions. As always, give me a shout if you have any questions that I can try to help answer and then be sure to grab your copy now! All these tools for less than $10 ! a complete graphics kit. I’m surely gonna give it a try. That is really cheap, I will certainly give it a try, thanks for sharing! What a great little tool kit everything you need in one place great value. It sounds too cheap to be true. But I can afford $ 10 so why not. Many similar tools to those have I already, but some seem new for me. That’s a very awesome tool for an affordable price. I’m sure gonna tell my friends about it. Thanks! Several months into my online business, I realized I am not at all talented in graphics, even if the software is easy to use. So I had to outsource this job to someone who is actually skilled. After a while, thanks to the great designs, my business took off, and now I have 5+ employees, and I am using an employee monitor software to check up on them, because they work from home. I will show them this package, they might find it useful. Thank you! I think that this would be an excellent product for people who don’t have much skills with Photoshop. I will make sure to tweet my followers about this. I like the price of this toolkit, and if it includes “mini site” templates then then that’s an added bonus. My biggest problem is the actual layout/template. How is the learning curve? Is it easy to work with? Kat, I haven’t used the mini site templates so I cannot really speak to how easy they are to work with. I just took a quick look at them now and it is really pretty straight-forward. But, the template is really for a sales type page where you are promoting something – think typical marketer sales page. That might be different than your definition of a “mini site” template. It does include all of the images and everything, all you need to do is really add your own text and any unique product related images and you should be set. This is great! Getting all those modules for only $10 is really tempting. 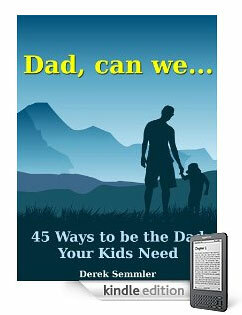 I’m not really an expert when it comes to Photoshop and having this seems like a great way to increase my sales. I’ll definitely grab a copy of this. But your link for the tool kits is death, please fix it. 404 Sorry, there is no page at this url. I’am very like your blog style. Thanks for letting me know! The creator of the toolkit is no longer offering that version as he has since released a new version that includes a number of new premium modules in addition to the original modules. However, the price has also gone up slightly but he produces great work and I still think this is a bargain for what you actually get – plus he likes to send out freebies to his customers from time to time. But now it is 30 tools instead of 21 and the price has just gone up to 19.95 dollars, which is still a cheap price for the whole package. That is correct; Max has released an updated version of the product and now includes more modules but the cost has gone up as well. But I have to say that I’ve been using his graphics for a lot of different things and am really happy. Hello, I want to subscribe for this blog to take latest updates, thus where can i do it please help.